Plastic Lobby Dust Pan Combo Kit with broom features easy lock two-way ergonomically designed "L" grip 32" high handle that can lock in an upright position. 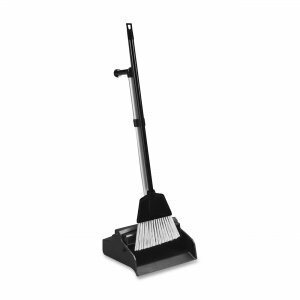 Offers enhanced angled bottom dustpan with increased tray capacity and refined front edge for maximum pickup. Includes innovative footrest pads. Comes with angled plastic broom with frayed bristle construction that will not absorb water. Combo kit handle provides convenient hanging hole and handy clip that allows broom to be attached.